Don't Get Pinched this St. Patty's Day: Wear Green! 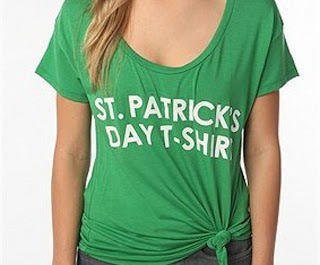 St. Patrick’s Day is almost here…in fact it’s this Saturday! Whether you’re Irish or not, use St. Patrick’s Day as an excuse to splurge on a green investment piece for seasons to come. There’s nothing like a silky shamrock green dress, Kelly green cardigan or mint green bag to get you in the mood for spring. 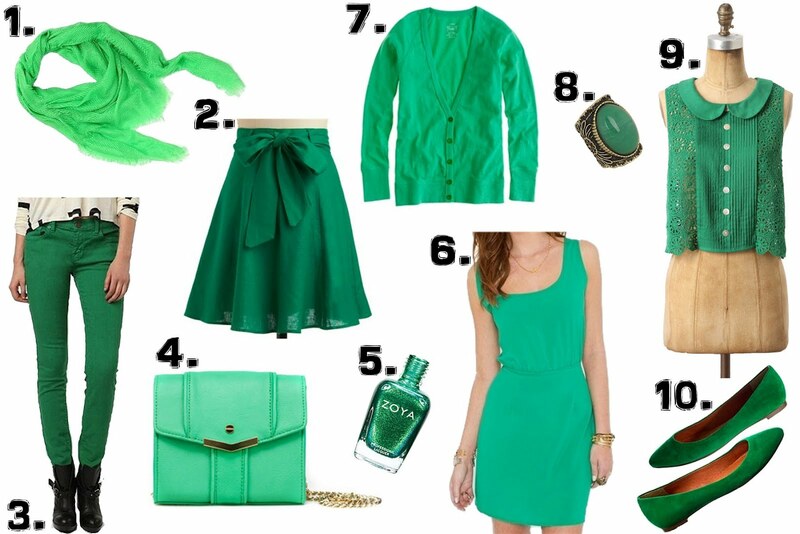 It doesn’t matter if you have a closet full of green, or none at all, there are plenty of green items to go around! Regardless of what your plans are (a night on the town or stuck at home with a bowl of Lucky Charms), there’s no reason not to wear your chicest green attire. Here are 10 clothing items and accessories that would make any fashionista green with envy! A gorgeous scarf in a vivacious shade of lime green is just what you need to add oomph to any ensemble. With spring looming ever so closer, it’s high time to break out your skirts and wedge sandals. What better skirt to make a debut in than this one from Modcloth, complete with a bow sash! Colored jeans are currently having a major moment! 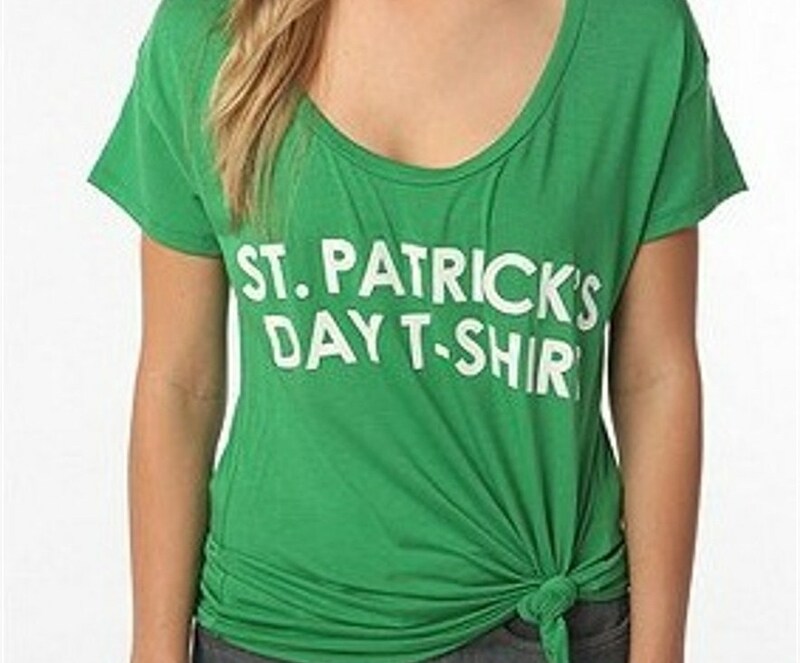 Slip into a pair of green skinnies and you’ll be more than covered on St. Patty’s Day (no pinches for you)! A girl can never have too many bags, let alone a bright green one! When I was younger, I remember it was tradition to always paint my nails with sparkly green polish around St. Patrick’s Day. This bottle of Zoya nail polish in metallic mermaid green makes me want to resume my yearly ritual (you should start one too!). With a cutout back and scoop neckline, this silk dress is the epitome of green dresses! The always reliable cardigan never fails to come to the rescue in your most dire times of need (read: St. Patrick’s Day!). It’s not how much green you wear that counts, but how much of a statement you make. This jade knuckle ring is a chic (and budget-friendly) accessory that will come in handy far beyond St. Patty’s Day! Be spring and summer-ready in this ϋber feminine blouse. With a peter-pan collar and beautiful lace, it will look impeccable when styled with a pair of high-waisted jeans or a gorgeous pleated skirt. Be green from your head to your toes thanks to this charming pair of skimmers! Wear green, be chic, and most importantly, avoid getting pinched!